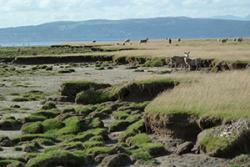 Eroding saltmarsh cliff, with grazing sheep in the back. : image Martin SkovThe first five research projects to be funded through the Welsh Governments’ £7m Sêr Cymru National Research Network for Low Carbon, Energy and Environment are announced in Cardiff today (Thursday 26 March). Chief Scientific Adviser for Wales, Professor Julie Williams, announced the five research consortia who will tackle the big challenges of water, food and energy provision in the face of climate change. The Network Director Professor David Thomas said: “The research aims to provide a major boost to Welsh science, and to generate real benefits for food and energy production and the environment, which will underpin future government policy development”. AquaWales: Research into ways of maintaining and improving aquaculture in the face of problems caused by climate change, led by Dr. Sonia Consuegra, Swansea University. Plants & Architecture: Research into the interactions between plants and buildings to improve human well-being, food security and reduce carbon emissions, led by Prof. Iain Donnison, Aberystwyth University. 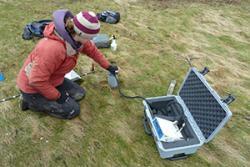 Measuring CO2 flux from an un-grazed marsh in Wales. Y Foryd, Gwynedd: all images Martin Skov.Quotient: Research into improving the effectiveness of marine energy as a reliable source of power, led by Dr. Simon Neill, Bangor University. 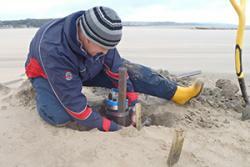 Resilcoast: Research into the harnessing of salt marshes to protect our coastline against floods and erosion, led by Dr. Martin Skov, Bangor University.